On March 15, 2018, 6 people were killed and 8 others were injured when an under construction pedestrian bridge collapsed in Florida. Several months later, the National Transportation Safety Board (NTSB) released their preliminary report while conducting an official investigation. The NTSB has recently released an “Investigative Update” to their preliminary report. Since the preliminary report was released in May, the NTSB has conducted many additional tests, which are highlighted in the most recent report. 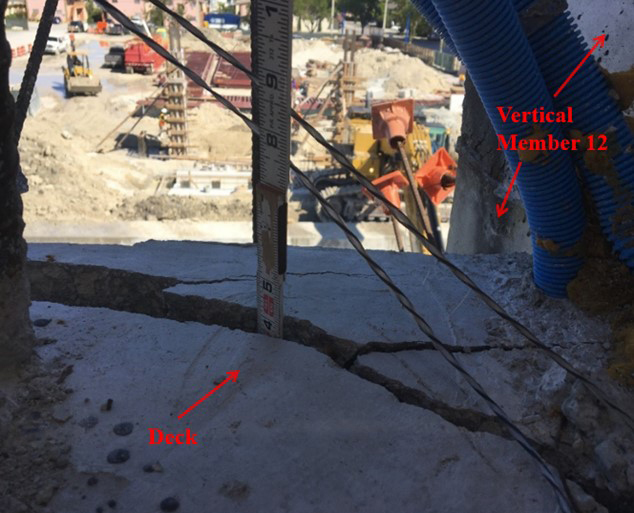 The post-tensioning rods, post-tensioning jacks, and concrete around the failure points have all been analyzed and the report states that there weren’t any “notable material issues,” found up to this point. Interviews have also been conducted with the majority of people and businesses the agency plans to talk to, but they did note that the remaining interviews are scheduled to be completed this month. 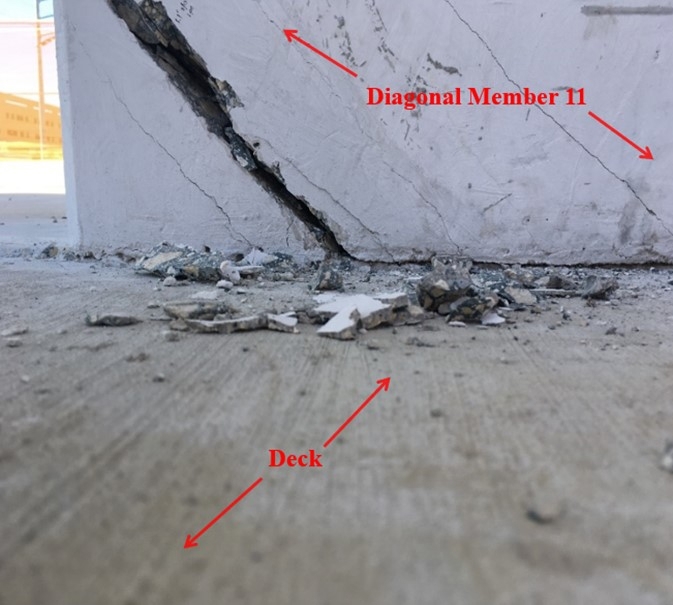 Perhaps the most significant information that was released in the report were pictures showing cracking around diagonal member 11. Vertical member 11 was in process of being re-tensioned when the collapse occurred. The bridges diagonal members were de-tensioned, per the plans, on March 10, 5 days prior to the collapse. 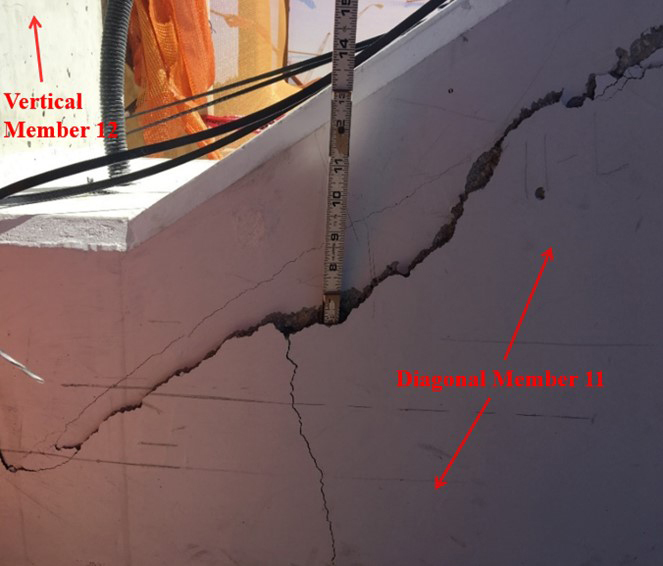 The preliminary report included several pictures, which were dated in February, of very small cracks near diagonal member 11. The pictures released in the latest report, dated March 13 (2 days before the collapse), show much more substantial cracking. The NTSB’s investigation is still under way and the group has not yet determined the probably cause of the incident. The biggest story in the construction industry last year was a shocking pedestrian bridge collapse that killed 6 and injured many others on FIU’s campus in Miami, Florida. Since the collapse, there have been many civil lawsuits filed, a closed OSHA investigation, and an ongoing NTSB investigative report. The General Contractor on that project, Munilla Construction Management (MCM), has recently filed for bankruptcy protection, according to the Miami Herald. On March 15, 2018, 6 people were killed and 8 others were injured when an under construction pedestrian bridge collapsed in Florida. Several months later, the National Transportation Safety Board (NTSB) released their preliminary report while conducting an official investigation. The NTSB later issued an “Investigative Update” to their preliminary report in August. In Mid-November, the NTSB released a 2nd investigative update, narrowing their root cause theories. Since the FIU bridge collapse last Thursday, there has been a lot of speculation on how exactly this catastrophe happened, based on pieces of information learned over the past few days, as well as a couple grainy videos of the collapse. It’s going to be a long time before investigations into the true causes are determined and all the dust surrounding impending lawsuits clears, but for now, we have one very interesting Youtube video explaining a plausible cause of the failure. Last Thursday, every construction professional’s worst nightmare happened. Lives were lost, both construction workers and civilians, by way of the catastrophic collapse of FIU’s under construction pedestrian bridge. We shared what we knew as of late Thursday night, but since this is not only a tragedy directly related to construction, but also a huge learning opportunity for the entire industry, I wanted to make sure we continued to follow and update on the story as it develops. Terrible tragedy struck Florida International University’s (FIU) campus yesterday when a newly installed pedestrian bridge collapsed onto the road below, killing at least 4 and severely injuring many more.